Collections can only be made within our normal working hours. VGA port: Yes. We do not accept Scottish currency. We do not accept any foreign currency. Collection in person Collection in person is usually permitted. Model: M4700. Hard Disk Drive Storage: 320GB. Manufacture: DELL. Battery: INCLUDED (Dell health status "NORMAL"). Product Line: PRECISION. For Sale Dell Precision M4700 in very good condition with Quad core i7-3740QM CPU, Quadro K1000M card, 8Gb Ram. Cruical 256SSD drive.15.6" Full HD screen. Dell m4700 workstation. k1100m nvidia with 2gb graphics . disks in good health see pics. Model: M4700. Hard Disk Drive Storage: 250GB. Manufacture: DELL. Battery: INCLUDED (Dell health status "LOW"). Product Line: PRECISION. Case – Grade C – Dented in several areas on casing (see pictures). Screen – Grade B – Very light scratch on screen. Keyboard – Grade A. A2 Grade – Excellent condition – one or two minor imperfections. Collection station availableType: Notebook/LaptopBrand: DellProcessor: Intel Core i7 3rd Gen.
Refurbished Dell Precision M4700 i7-3740QM 2.70GHz NVIDIA Quadro K1000M Grade A 15.6" 1920x1080. Only thing I would have to add is the battery life which is 40-45 minutes. Due to the specs I used it pretty much as a desktop. (Precision M4700. Number of HDMI Ports. Hard Drive Size- 500. HOWEVER, THIS DOESN'T AFFECT THE LAPTOP'S FUNCTIONALITY). -Windows 10 Professional. All UNITS HAVE BEEN THOROUGHLY TESTED. ALL IMAGES ARE FOR ILLUSTRATION PURPOSE ONLY ✩. Model: M4700. Hard Disk Drive Storage: 320GB. Manufacture: DELL. Battery: INCLUDED (Dell health status "LOW"). Product Line: PRECISION. Make & Model - Dell Precision M4700 15.6" Laptop. Hard Drive - 320GB SATA HDD. Optical Drive - DVD RW. DELL LAPTOP This is for a DELL Precision M4700 Laptop Specifications Intel Core i5 8 Gb Ram 500gb Sata Hard Disk Nvidia Quadro K1000m Graphics Card 15.6" FHD screen which will run 1920x1080 Wifi (Wireless) Web Camera DVD RW Good battery Windows 7 certificate upgrade to window 10 Full size UK keyboard Fully tested & working perfectly with no problems. It is in good condition but does have marks/scratches Comes with power supply and mains lead. Make & Model - Dell Precision M4700 15.6" Laptop. Solid State Drive - 256GB SATA SSD. Optical Drive - DVD RW. Rare NVidia Quadro M1000M video card! from top models. For Sale Dell Precision M4700 in used condition with Quad core i7-3740QM CPU. (however Customised installation) 16Gb Ram. 256SSD drive.15.6" Full HD screen. We will deal with queries quickly and be as flexible as we can to get you sorted out. office hours on 0161 928 1144. Northern Island or the Channel Islands. Item has bios or software issue listed below. DELL PRECISION M4700 LAPTOP. 750GB HARD DRIVE. 3rd Generation Core i7. Dell Precision M4600. Windows 7 Professional (64bit). Original Dell adapter included. Hard Drive. Optical Drive. Dell Precision M4600. Original Dell adapter included. Windows 7 Professional (64bit). Hard Drive. Optical Drive. Mouse / Pointing Device. Full sized US Keyboard with Number Pad. PRODUCT SPECIFICATIONS. DELL PRECISION M4700 LAPTOP. Dell Precision M4700. 1TB HARD DRIVE (Upgraded). 1TB Hard Drive. Windows 7 Professional (64bit). Original Dell adapter included. Used Good - Showing few signs of use, marks, buff, scratches or few dints to be expected. These wears in no way affect performance of the laptop. Windows 10 Professional. Critical applications will run smoothly with independent software vendor (ISV) certification for many professional applications. 256GB SSD - £85.00. - A massive 20GB RAM for smooth multi-tasking. - NVIDIA Quadro K1000M Graphics Card for crisp visuals. Hard Drive (Storage)1TB (1000GB) HDD. Display15.6" - 1920x1080 Dell UltraSharp, anti-glare, LED-backlit, premium panel. Avast Antivirus - security software. Fingerprint Scanner. eSATA/USB 2.0. 2x USB 2.0. Dell precision M4700 core i7-3740 m2 2.7 GHz 8 GB 128 GB SSD Windows10 grade. Modell M4700. 2 GB NVIDIA K1000M graphics GDDR5. Integrated webcam. German keyboard. Graphics Card: NVidia Quadro K1000M 2 GB GDDR5. Used Dell Precision M4700 workstation. Is missing a rubber foot, but the laptop still sits nice and flat on a desk. Good condition Targus bag. Has a small piece of plastic broken off bottom left of display bezel, see 7th photo. DELL precision M4700 15.6 "FHD i7-3840 sqm Quad 4 x 3.8 GHz 8 GB RAM 256 GB SSD Windows 10 Pro x 64 K1000M with 2 GB". DELL precision M4700. Modell M4700. 256 GB SSD. 4 x 2.8 GHz. Up to 4 x 3.8 GHz. Festplattentyp SSD (Solid State Drive). Graphics Card: NVidia Quadro K3100M 4 GB GDDR5. Dell precision M6800 core i7-4700MQ 2.4 GHz 32 GB RAM 250 GB SSD 17.3 "HD TFT. Modell M6800. HDD: 250 GB SSD. SSD-Festplattenkapazität 250GB. 2.40 GHz quad core. Graphics Card: NVidia Quadro K3100M 4 GB GDDR5. Dell precision M6800 core i7-4810MQ 2.8 GHz 16 GB RAM 1 TB 17.3 ' full-HD. Modell M6800. 2.80 GHz quad core. HDD-Festplattenkapazität 1TB. Arbeitsspeicher 16GB. 11.1 V 97Wh. 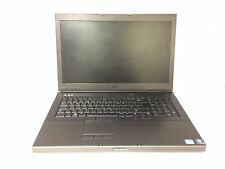 Dell Precision M4600 Dell Precision M6600 Dell Precision Dell Precision M4700 M6700. ORIGINAL DELL battery. NEW PRODUCT. Laptop Parts and Electronic Products Wholesaler, Distributor and import. 09GP08 0FV993 0JHYP2 0PG6RC 0R7PND 0TN1K5 312-1178 9GP08 FV993 JHYP2 R7PND TN1K5. 11.1 V 97Wh. Dell Precision M4600 Dell Precision M6600 Dell Precision Dell Precision M4700 M6700. Numéro de pièce fabricant FV993. 09GP08 0FV993 0JHYP2 0PG6RC 0R7PND 0TN1K5 312-1178 9GP08 FV993 JHYP2 R7PND TN1K5. 11.1 V 97Wh. Dell Precision M4600 Dell Precision M6600 Dell Precision Dell Precision M4700 M6700. ORIGINAL DELL battery. Make & Model - Dell Precision M4700 15.6" Laptop. Hard Drive - 750GB SATA HDD. Optical Drive - DVD RW. DELL PRECISION M4700 LAPTOP. Dell Precision M4700. Windows 10 Professional (64bit). Original Dell adapter included. 750GB HARD DRIVE. Hard Drive. 750GB Hard Drive. Optical Drive. DELL PRECISION M4700 LAPTOP. Dell Precision M4700. 750GB HARD DRIVE. 750GB Hard Drive. Original Dell adapter included. Hard Drive. Optical Drive. Used Good - Showing few signs of use, marks, buff, scratches or few dints to be expected. Dell Precision M4700. 1TB Hard Drive. Original Dell adapter included. Windows 7 Professional (64bit). Used Good - Showing few signs of use, marks, buff, scratches or few dints to be expected. Overall in good condition. Dell Precision M4700. Original Dell adapter included. Windows 10 Professional (64bit). Hard Drive. 750GB Hard Drive. Optical Drive. Used Good - Showing few signs of use, marks, buff, scratches or few dints to be expected. Dell Precision M4700. 750GB Hard Drive. Original Dell adapter included. Hard Drive. Optical Drive. Used Good - Showing few signs of use, marks, buff, scratches or few dints to be expected. Overall in good condition.